Photograph courtesy P Eckersley, collection of webmaster. Its September 30th 1967 as Class 25 No. D5254 and Class 9F 2-10-0 No.92128 have just cleared Settle Junction with a Heysham - Neville Hill tank train. Above the last tank wagon are the ‘split’ distance signals for Settle Junction, (left hand for Lancaster, right hand one for the S&C numbered 16 & 13 signals). Behind the 9F is Settle’s 10 signal which is his section signal. The speed restriction at Settle Junction was 20mph, hence the train will now be accelerating eastbound towards Long Preston & Hellifield. D5254 was allocated to Leeds Holbeck from June 1966 to December 1967. The sixteen year seven month career for D5254/25104 included allocations to three Eastern Region depots, the remainder being to London Midland Region depots. November 1965 to Nottingham Division (D16). December 1965 to Thornaby (51L). December 1965 to Leicester Division (D15) on loan. January 1966 to Thornaby (51L). June 1966 to Holbeck (55A). December 1967 to Carlisle (12A) on loan, made permanent January 1968. 25104 was the 108th Class 25 withdrawn, one of three retired during September 1982. After withdrawal 25104 was stored at Crewe from October 1982, at some point it surrendered its fuel tank and batteries to another Class 25. It was moved (details below) to Swindon Works March 28th - 30th 1984 and scrapped there by the first week of December 1986. 25104/124, 46016 Crewe – Bescot – Swindon, March 28th - 30th 1984 (46016 from Bescot). Noted Darlington Works September 1965. Noted Derby Works May 1967. Noted Derby Works July 1971. 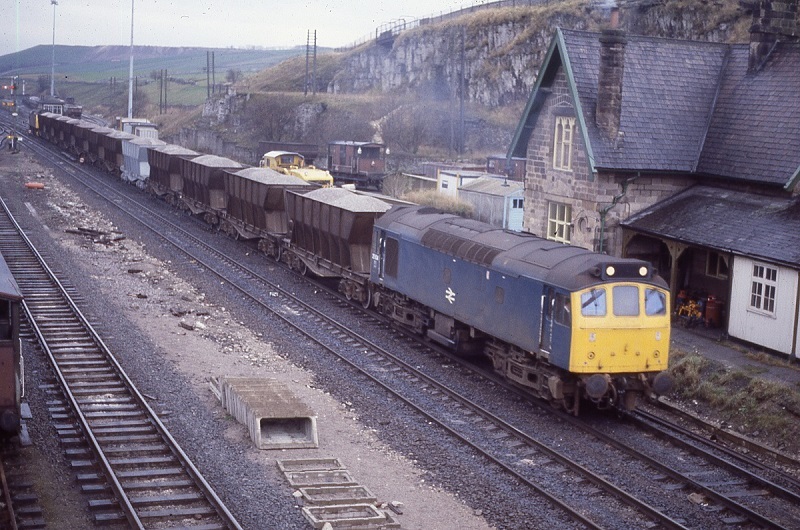 Noted Derby Works December 1972. On October 24th the 08.25 Birmingham New Street - Newcastle with 45144 failed at Chesterfield, D5254 provided assistance to Sheffield. 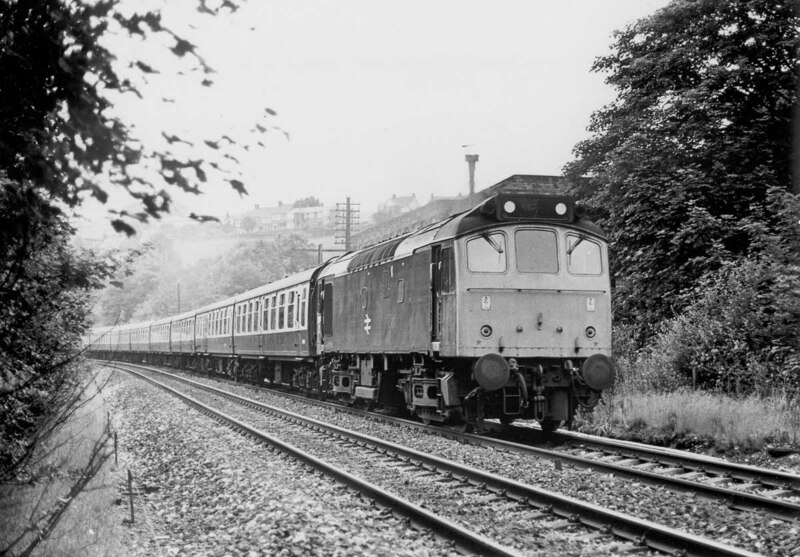 On July 22nd 1967 D5254 was noted on a Leeds - Morecambe service. An Open Day at Leeds Holbeck on September 30th, no doubt celebrating the twilight of steam in the area, especially the few remaining Jubilees, found the following Sulzer Type 2’s on ‘display’: D5096, 5100/73/79, 5254/90, 7526/48/68-70/95 & 7625. On this day D5254 had worked a Heysham - Neville Hill tank train with a 9F - see view above. Condition September: two-tone green livery with small yellow warning panels, three-rung bogie mounted footsteps, ridge sided sandboxes, engine exhaust in original position. On March 28th 5254 worked the 00.55 Washwood Heath - Southampton freight and the return 05.55 Eastleigh - Bescot, presumably throughout. The dismantling of the fast lines between Heaton Lodge & Hillhouse was completed towards the end of November, noted on one of the dismantling trains on 11th was 5254. On May 24th 25104 handled a Birmingham – Brandon (Norfolk) troop special, the locomotive returning light engine to March. 25104 & 25040 worked the 08.00 Walsall - Yarmouth to Norwich and the return 14.15 Yarmouth - Derby from Norwich on June 14th 1975. The next day the same pair worked a Leicester - Skegness roundtrip. The few recorded workings for 1976 have a north-west influence. On January 24th 1976 25104 & 25048 worked a portion of the LCGB 'Pennine Venturer 3' railtour from Manchester Victoria to Bradford Exchange, at some point 25048 had replaced a failed 25046. On May 29th 1976 the 09.20 Manchester Piccadilly - Yarmouth was worked to Lincoln Central by 25104 & 25040 (did they complete the return leg?). On July 31st 1976 25104 & 25199 worked the 09.20 Manchester Piccadilly - Yarmouth to Lincoln Central returning with the 09.15 ex-Yarmouth. 25104 was noted eastbound at New Mills Central with a bulk powder train on June 9th. On June 21st 25104 was noted passing Stockport with a breakdown train. On a dull and wet Sunday January 21st 1978 whilst doing a tour of the Cheshire area depots prior to visiting Crewe Works, 25104 was noted parked in front of the old steam depot. 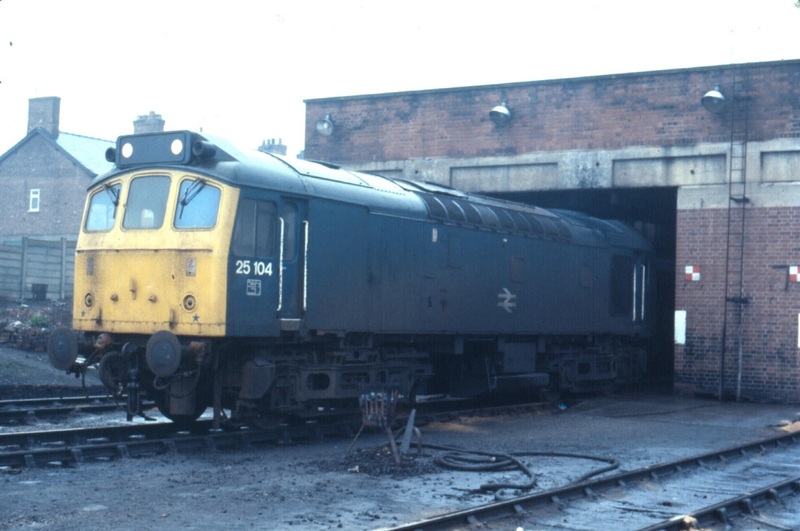 25104 is one of those Class 25's that had its boiler room grille sheeted over whilst receiving repairs at Derby Works. 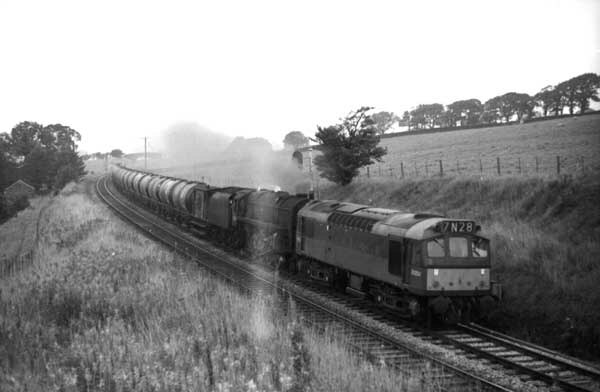 On July 13th 25104 worked a freight to Heysham Harbour. On July 15th 25104 was noted passing Agecroft Junction towing failed 25154. On July 22nd (or 29th?) the 13.02 Llandudno Town - Nottingham saw 25104 replace 25268 at Stoke-on-Trent, working forward to Nottingham. On September 11th 25104 worked the 07.47 Manchester Victoria - Bangor and the 11.30 return. 25104 was noted passing through Manchester Victoria light engine on September 15th. 25104 and banker slowly push/shove twelve loaded hoppers towards Peak Forest summit (982') on November 23rd 1978. On April 20th 25104 was stabled at Northwich. On July 14th 1979 25104 & 25253 worked the 10.10 Euston - Aberystwyth from Birmingham New Street, returning with the 16.10 Aberystwyth - Shrewsbury. Two weeks later, on July 28th 25104 worked the 09.00 Llandudno Town - York throughout. No passenger workings have so far been recorded for 1980. Photograph courtesy Larry Goddard. 25104 eastbound at Greenfield with the 09.00 Llandudno - York July 28th 1979. With at least nine coaches in tow it must be assumed that the 25104 is putting out its unmistakeable Sulzer sound. On November 6th 25104 & 25208 worked the 01.36 Whitemoor - Temple Mills freight, via Broxbourne, the return working being the 06.00 Temple Mills - Whitemoor. 25104 was stabled at Newton Heath on December 1st. 25104 was noted on ICI bogie hoppers westbound at New Mills on February 17th and at Northenden Junction on February 20th. 25104 was the Manchester Victoria pilot on August 3rd. 25104 was stabled at Blackburn on September 6th. On January 24th 25104, 25105 & 25290 were stabled at Derby. On April 16th 25104 was noted eastbound at Guide Bridge with empty ICI bogie hoppers for Tunstead. The final passenger workings for 25104 took place in 1981. On May 27th/28th 25104 was busy working in North Wales, starting out with the 27ths 13.40 Manchester Victoria - Llandudno Town, the 16.42 Llandudno Town - Crewe and a relief 20.30 Crewe - Bangor. The next day (28th) 25104 handled its final passenger working, a relief 20.30 Crewe - Bangor. On a wet May 29th 25104 was at Blaenau Ffestiniog with a train of track panels. 25154 & 25104 were stabled at Newton Heath on July 17th. 25104 was withdrawn on September 26th 1982. Page added June 19th 2013. Last updated April 7th 2019.